The committee cares for graveyard property including removal of branches and dead leaves, raking, mowing grass, filling depressions with fill and maintaining stones. A yearly inspection of the cemeteries is conducted. Meetings are scheduled as required and the committee reports to Parish Council. For information on the availability of lots and the regulations that control them, please contact the Parish Office at (902) 864-3154. Historical location: The old cemetery at St John’s was established between 1790 and 1804. Cemetery plots include many of the prominent and founding families of the Sackville and Bedford areas including the Uniacke family plots, Charles Fenerty, who invented the process of making paper from wood pulp, local heroes such as Leslie Thomas, Gertrude Parker and A. J. Smeltzer and prominent local politicians such as Archie Fader and Glen Slauenwhite. The tombstone engravings represent the rich cultural history of the area. The Tower is located in the old Cemetery near the Parish church in a quiet, well lit area. It is fully wheel chair/walker accessible from the driveway. It is made of smart looking polished black and white granite that will withstand the wear from the elements. Each side panel is suitably engraved as shown in the photo on the front panel. Tower size – 5 feet tall by 68 inches square – 40 niches, 10 per side. Niche sections are polished black granite. Side display panels are white polished granite. Each niche can hold two urns of ashes. No single niches at this time. Perpetual care funds will provide for ongoing landscaping of the general area, regular cleaning, repairs (weather, vandalism, misuse), insurance costs, lighting; and, the equipment, housing and employee costs to carry-out such care. 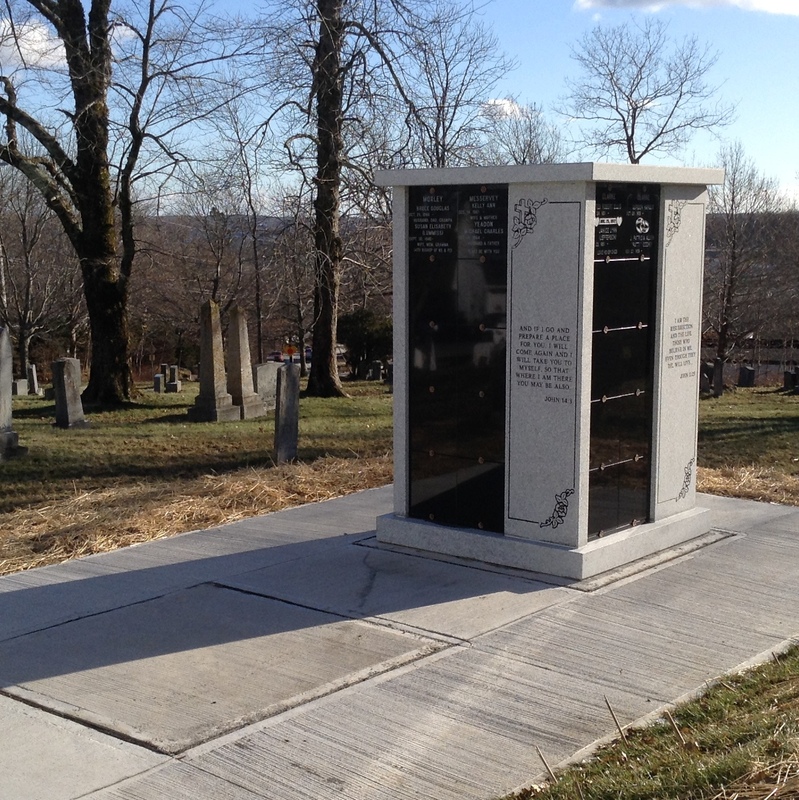 All people will be welcome to be interred in the Columbarium. The Columbarium will be administered by St. John the Evangelist Parish. An identified Parish representative will attend the internment of non-Parishioners to receive the required death and burial certificates and confirm the internment. To purchase your niche, see the contact information following. A committee member will be happy to answer your questions, help you complete a Niche purchase form, if you wish, and arrange payment with you by cash or cheque. The prices are in the Pricing Panel. Cheques are to be made out to St. John the Evangelist Church Cemetery Committee. The opening and closing of the niche at internment is *$200.00. Any additional/future opening/closing of niches will be *$200.00. Bud Vase – available addition to a niche door – contact Heritage Memorials for a price quotation. If a purchased niche is not going to be used by the authorized owner, St. John the Evangelist Parish will buy back the niche for 90% of the amount paid. * All prices are as of December 2017. Changes to prices are dependent on supplier prices and annual cost-of-living increases approved by Parish Council at the time of construction or later. visit the Old cemetery and view the planned Columbarium tower location. purchase a niche (there is no monthly or other extended payment plan). obtain a Cemetery/Columbarium Rules and Regulations booklet.